Zealandia is an almost entirely submerged mass of continental crust that sank after breaking away from Australia 60–85 million years ago, having separated from Antarctica between 85 and 130 million years ago. It has been described as a lost continental, a microcontinent, and submerged continent. 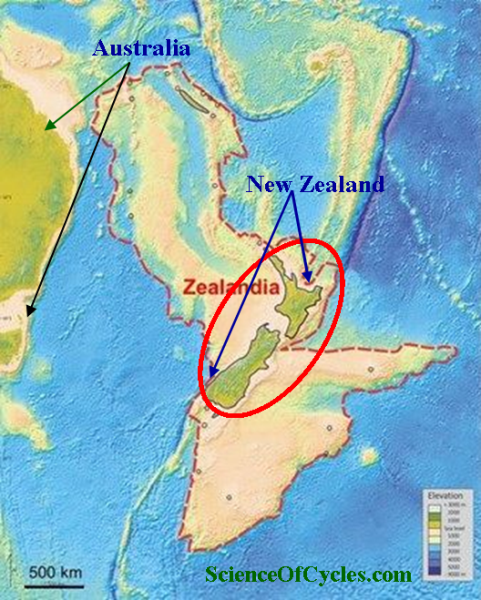 The name and concept for Zealandia was proposed by Bruce Luyendyk in 1995. The land mass may have been completely submerged about 23 million years ago, and most of it (93%) remains submerged beneath the Pacific Ocean. With a total area of approximately 4,920,000 km2 (1,900,000 sq mi), it is the world’s largest current microcontinent, more than twice the size of the next-largest microcontinent Mauritia, and more than half the size of the Australian continent. As such, and due to other geological considerations, such as crustal thickness and density, it is arguably a continent in its own right. This was the argument which made news in 2017, when geologists from New Zealand, New Caledonia, and Australia concluded that Zealandia fulfills all the requirements to be considered a continent, rather than a microcontinent or continental fragment.